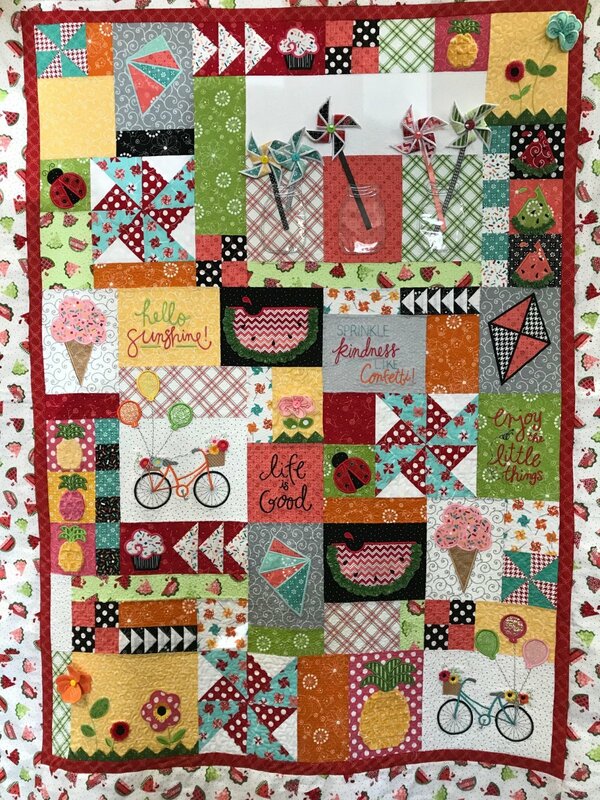 Say Hello to Sunshine and Spring 2019 by creating this fun quilt top from Kimberbell! Anne Beale Yancey will be teaching you the techniques in this fun project. Choose either the sewing version or the embroidery version to make this quilt top. Say Hello to pinwheels, pineapples, and dozens of designs! Each phrase and applique design comes in 3 sizes: 4x4, 5x7, and 6x10. Quilt top measures 52" x 67" and uses a 4x4 and 5x7 hoop for the Embroidery version. Please note: backing, binding, and quilting is not part of this class. Detailed instructions for dimensional embellishments such as felt flowers, fringe, chenille, and Mylar balloons are included in the pattern books. Pattern books can be ordered from Dublin Sewing Center. Embroidery version contains a CD that includes dozens of designs and embroidery techniques. This instruction book features dozens of designs and detailed instructions for embellishments like chenille, fringe, felt flowers, pinwheels, and Mylar balloons. Learn Kimberbell's easy method for prairie points, ruching, and piecing the windmill block. Bonus projects too! Unique IN-THE-HOOP embroidery techniques include: Dimensional Mylar balloons, fringe flowers, felt flowers, pinwheels, Chenille pineapples, Vinyl Mason Jars, and pieced Flying Geese units, prairie points and more! Includes 24 appliques and sentiments files each in 3 sizes: 4x4, 5x7, and 6x10! Bonus projects too! Classroom sample (picture on website) is made from a Kimberbell fabric and embellishment kit. Limited supply of fabric kits available from Anne Beale Yancey. Kits include all fabric and embellishments to make the quilt top. Kit fee is $145 payable to Anne Beale Yancey. There are two colorways for the outer borders, either white or black. Please specify which color for Anne Beale. If you choose to pick your own fabrics and embellishments, all information on size needs is available in the Pattern Book. Hello Sunshine Sewing Version Pattern Book- $19 Hello Sunshine Embroidery Version Pattern Book and CD - $79.95 Sewing machine and/or Embroidery machine must be in good working condition. Students must be familiar with their machines.